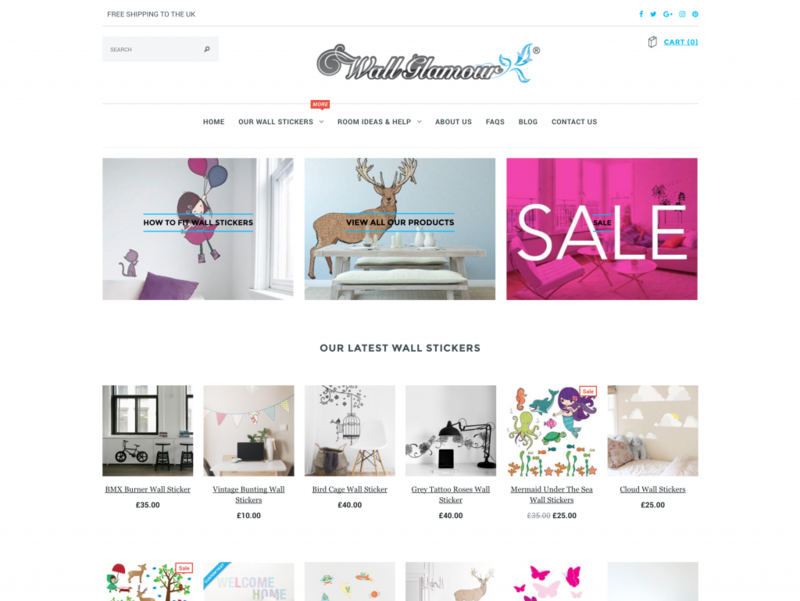 Wall Glamour have been running an online Shopify store for over 10 years, and have had a lot of success in that time. From being featured on 60 minute makeover to being written about in many of the nation’s Home magazines. They supply a unique range of wall stickers that allow you to add really interesting artwork to your walls without needing to stencil or get dirty with paints. I personally love it, so much so that I have their massive tree wall sticker behind my bed. When Wall Glamour came to us for their website overhaul, they had run into some trouble on the search engines. After riding the wave of being number one on google for a very long time, they quickly noticed sales drop off and the phone stop ringing, this was all down to their website being penalised for something, so we started off by updating the theme in the hope that a fresh set of templates and code would help get them further back up the rankings. Our job was to take the Shopify website and reskin the part that the users see, and you can do this without affecting any of the underlying workings of the website. This is one of the great attributes to Shopify. Working directly with Rick, the business owner, and in charge of the design, we started work on making the site look modern and fresh and much more appealing to use. We added microdata, made the website work on mobiles properly, and a whole host of other features to try and win back some SEO points after the damage done by Google’s Panda update (the name of Google’s algorithm change), and while there is still a lot of ongoing work to do with Wall Glamour, we are back in the rankings and slowly creeping back up the search rankings. The website has been received well from their existing user base.